Pat managed to get us tickets for the Saturday morning qualification session. This was the qualifying for the Men’s Sprint, the 250m TT for the Men’s Omnium and the round of 16 for the sprint. It was disappointing that Jason Kenny and Gregory Bauge got ride overs in the round of 16 but it was great to be in this fantastic new facility. I hope I get to ride it one day. So that’s where we are! >And so it begins again. I’ve had a fortnight of occasional short, gentle rides rather than training. We’ve been packing the house ready for the move and that has taken all of our attention. Despite this I did want to ride today’s event. I’ve got very anxious over the last weeks and cycling has helped take some of the pressure off. I had a particularly good ride on Friday – an hour at Hillingdon on the Planet X TT bike for the first time in months. It felt like flying. On Tuesday I’d struggled to average 16mph on the road bike. On Friday, despite no effort longer than three miles, I did 19 miles in the hour. Given how unfit I’ve been feeling, it was a big boost. It was good to say ‘ta ra’ to the Tuesday/Friday veterans as well. I’m not going to miss the regular kickings they gave me though. So Friday and Saturday we broke the back of the packing. The loft is empty and our life is almost all in boxes. This meant that I could legitimately spare the morning for a proper bike race – the West London Combine / Maidenhead and Dist CC 10m TT on the Knowl Hill course (H10/2). We might have had the Tour Down Under, Omloop Het Nieuwsblad and the Strade Bianche, but we all know the season really begins at a village hall just outside Maidenhead in early March. It was a cool, crisp morning with a slight tailwind to the turn. This made the early rise to Knowl Hill a little less lung bursting than usual, but made the last half a mile a living hell quite hard. I was pleased with my ride. Last year I messed it up by being on medication and snapping a gear cable on the way to the start. Two years ago I did a 26:37. Today I did exactly the same time. I’m not progressing as well as I might! CORRECTION: I misread my time. It was actually 20 seconds slower – 26:57. I need new specs. As it was an association event I rode in the colours of my second claim club, the Willesden. That should be my last ride for them… It was good to say cheerio to so many of the team mates and friends from other clubs who have made the nearly five years we’ve lived in London so nice. Apologies that I didn’t get to chat to all of you. Thanks all. >The time trialling season begins for me tomorrow with a 10 mile event. I will report (eventually). Next weekend I have a weekend off the bike to go and see my artworcs friends. I am also attending the 20:20 conference in Birmingham where my short play A Page Turner is receiving its first performances alongside 19 other short plays by writers who attended the MA / MPhil(B) in Playwriting Studies at Birmingham University. My sister, Marie, won two Silver medals at New Zealand’s National Masters Championships. She was second in the 500 metre TT and the Individual Pursuit. Well done (again), Marie. We took last weekend off to celebrate Pat’s birthday. Two films at the BFI: Letter for an Unknown Woman on the Saturday and Guess Who’s Coming to Dinner on Sunday. The former harks back to the well-made play of the late nineteenth century (the heroine – a good woman who does a bad thing – handily gets a disease that kills her as a kind of moral retribution. The sort of plot that only survives in opera nowadays). The latter has a tight cause and effect, three act structure that felt much more modern. I didn’t cry watching Spencer Tracy‘s last performance… I didn’t. I don’t cry. It was a good weekend. Today I was at Hillingdon cycle circuit helping Ray and the rest of the club run a British Cycling Go Ride event for school children new to the sport. It was great fun with some really committed performances by the kids. It was very cold though. My sister Marie has won three Gold medals and a Silver at the New Zealand Masters Games in Dunedin. She won the 500m TT, the 2km individual pursuit and the 4km scratch race. The Silver medal came in the 500m sprint where she says “my legs died at the end”. Apparently it was a roasting hot day in Dunedin. My speed wasn’t great […] but I actuallyfelt good racing! The scratch race was a combined event with the men (cos therewasn’t enough competitors for a full field in either category). We dropped theother women in the first lap (when the men took off), but I hung on for grimdeath until the final (16th) lap when the men lost me in their sprint. 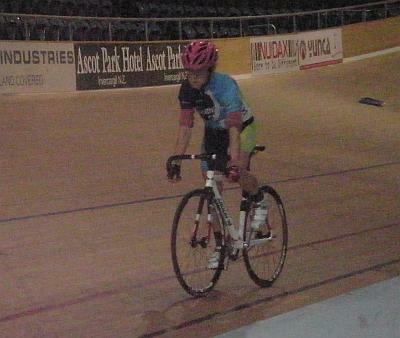 She has qualifying for the National 2000m individual pursuit coming up on 16th February – Good luck, Marie. > I am back from my around the world trip and I’m still suffering from jet lag. We’ve been away for a month. Last night’s training session at Hillingdon cruelly exposed the expected lack of fitness. However, I did manage to get a few miles in while in New Zealand – thanks to brother-in-law Jon for the loan of bikes while I was there. 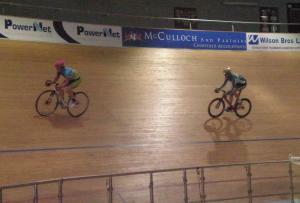 The indoor velodrome at Invercargill (NZ’s only indoor track) is a great facility with plenty of opportunities to ride. The Junior World Championships will be held there in 2012. NZ did really well at the recent Championships in Moscow and will continue to improve with this sort of facility at their disposal. I had a few goes at riding the boards. The photo show me learning to ride the banking by following my (almost a Kiwi) sister Marie. I used to beat her all of the t ime but now she’s a much stronger rider than me. Her daughter Jen is even faster. 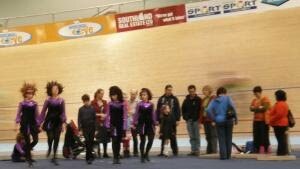 At one session I was one of the riders who appeared live on NZ TV’s telethon, part of which was broadcast from the track (the photo on the right shows the Irish dancers with the blur of a rider in the background). By the end of the holiday I was riding in groups but I was still nervous high on the banking. I’d like to do more track, but I have no top end speed at all (my flying 200 time was the same speed as my 25m TT season’s best). 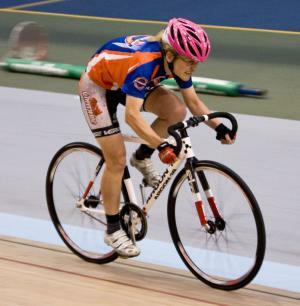 >Big congratulation to my niece Jen who last week won a Silver and two Bronze medals at the New Zealand National Track Championships at the Invercargill Velodrome. She was riding for the Southland team in the Under 15 Girls category. Well done, Jen! Her mum and my sister, Marie, also rode a demonstration 2k pursuit with very little notice. Bursting out of the start gate at the national championships is probably not the best time to ride aero bars for the first time! Well done, Masha. Meanwhile, back in the land of wind and inconsiderate traffic, the West London Combine gunned into 2009 action with a well supported 10 mile time trial on the Maidenhead Thicket course. There were 82 finishers and I ended up 30th with a time of 26 minutes and 37 seconds. I’d been planning to go faster (short 26 / long 25) but reality and a headwind to the turn intervened. The numbers were in the right area so I just need to get fitter. Race stats: 10 miles in 26:37 (22.54mph). 30th out of 82 finishers. Slowest mile (1): 3:01 (19.89mph). Fastest mile (10): 2:01 (29.75mph). First 5 miles: 14:38, last 5 miles: 11:59. Max heart rate: 172bpm, average HR: 160bpm. Winner Peter Weir (Maidenhead & Dist CC) 22:47. Looking at last year’s result, riders went back, on average, 20-25 seconds and I improved by 85 seconds, so progress of a sort.